It’s not as I expected…but just as I expected. I expected hordes of people passing through our house. I knew the messes were inevitable. I knew that clouds of dust would find their way into small hidden spaces and loud noises would ring throughout the day. I knew that keeping our dogs smiling would require extra love. I knew too that without a kitchen, life would be interesting. I was ready for all that, and even my husband would attest that I’ve been quite the good sport through all most of it. But I imagined that I could cook and I could then post what we ate for dinner. How hard could that be? As you’ve noticed, I’ve gone silent. It’s not from lack of intention or interest. Life – moving throughout the day – just takes far more of me during this remodel than I ever imagined. It’s been good, but it’s been complicated. It’s been fun, but it’s been challenging. It’s been exhilarating and occasionally it’s been exhausting. I used to read in the mornings, but reading has stopped. I exercised often. That was then. I corresponded with friends and family. Now it’s howdy waves in passing or texts with lots of code talk. Leaving all rhythms behind can be frustrating, and all the more so the tighter we hold. I knew that no matter what I expected, I would be surprised. Expecting to be surprised makes surrendering to the inevitable far easier though, don’t you think? We’re about half way through…or so we imagine. But of course we don’t know. We humans think we know a great deal and frequently we’re mistaken about that. There will be more surprises for us. (And for you.) May we find our way to be graceful through them. Our kitchen is nearly done. Dribs and drabs remain. But we have water now, and heat to cook with. Our food is now within reach, and pots are bubbling on the stove. Spree is stirring. And though it’s Wednesday, and you might have expected vegetables (because I did lead you to that belief didn’t I?) ~ here is the smallest of offerings. Days later – OK friends – even though you’ve gone to all the trouble to conjure this dish, we’ve enjoyed the dinner again and I’ve now got the photos for you. Preheat the oven (or toaster oven if you’re camping out indoors or feeding only 2) to 420°F (215°C). Cut parchment paper into 14 to 16-inch square pieces. In a large bowl mix the vegetables along with spices and herbs, and salt and paper. Remove the zest from one lemon, and cut the other into thin rounds. 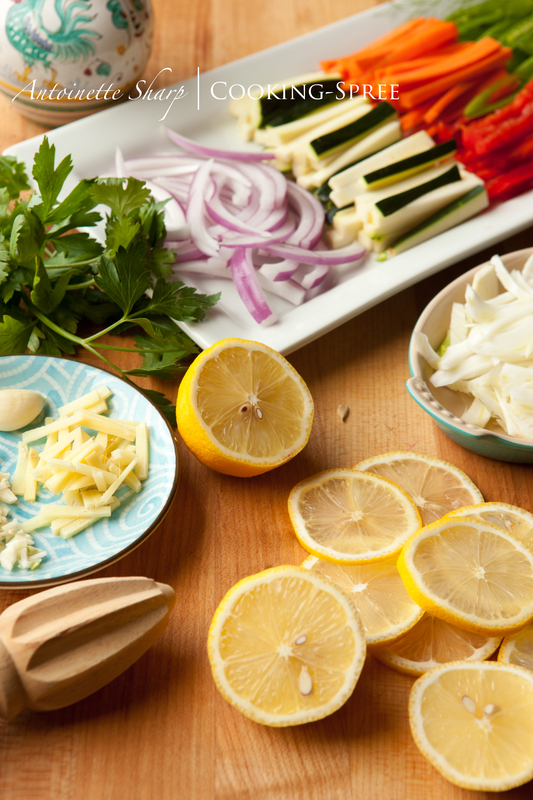 Set these aside as you prepare the fish. Rinse the halibut quickly in cold water then pat dry with paper towels. Place one of the parchment paper squares on your work surface and brush with olive oil. Make a bed of approximately one-eighth of the vegetables in the center of the paper, then place the fish skin-side up into the middle of the nest of vegetables. Drizzle with lemon juice & sprinkle with zest. 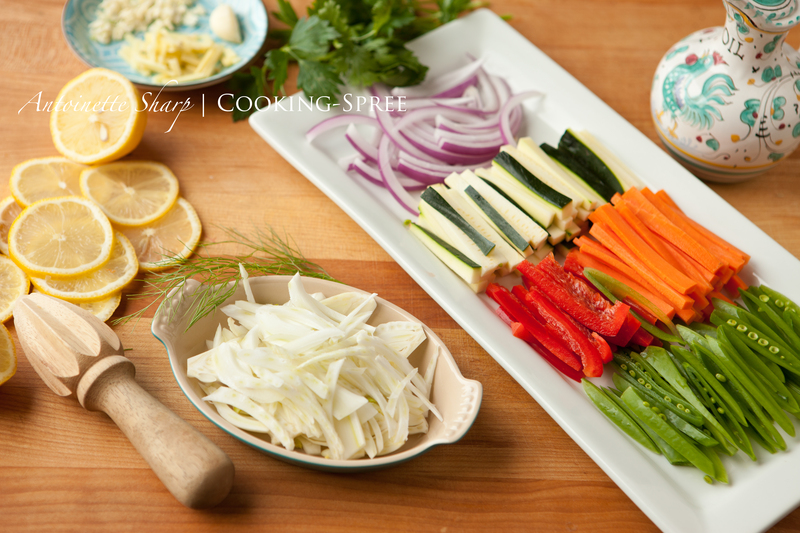 Lay another layer of vegetables on top, add 2 or 3 rounds of lemon, salt & pepper, a sprig each of parsley and cilantro if you like, and then drizzle with olive oil. Create a little package – draw 2 sides up to meet each other, fold them down several times being sure allow enough room in the papillote for fish and vegetables to “breathe” and for steam to puff up the package. Tie the ends with kitchen string or create a tight couple folds to seal the ends. Place on a rimmed baking sheet and repeat with the other papillotes. Place in preheated oven. What a lovely way to write about “absolute chaos”! Well done and I love the photo of the tool belt hanging there in the wall, I presume. Nice! Getting ready to go to La Grande next week for Karmy’s graduation ceremony…whew…she made it to the top of her personal “Everest” and we’re all gonna put the flag in the ground on the summit with her! YEAH! Much love to you and much to do for me per usual…Lots going on but wanted to send you some love. I had a make-shift kitchen – it was very much like camping – and not at all bad, just more complicated without water and refrigerator nearby. Good luck with finding good weather for those 3 extra feet on your deck! Won’t it be nice! This sounds like a delightful spring dinner. I’ll look forward to the photos. It is easy to imagine this dish as you described it lovely. 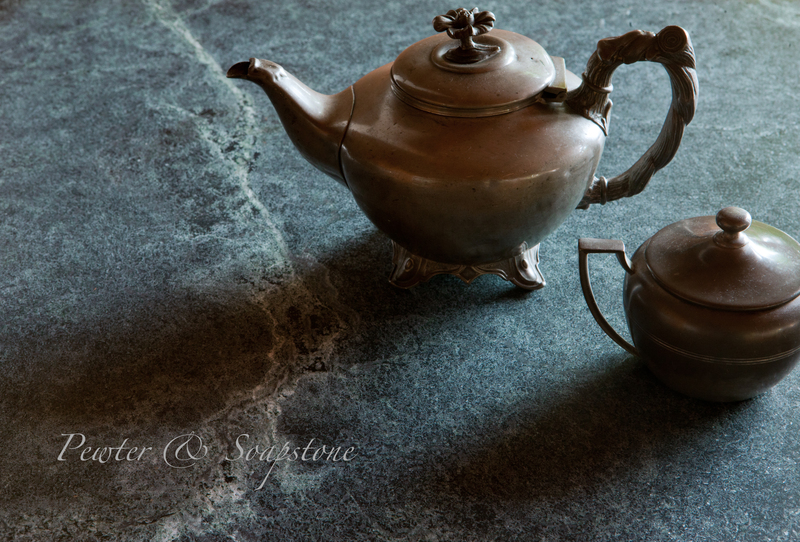 Love the antique teapot by the way. Isn’t the teapot a pretty thing? Comes from the mother of a very dear friend of mine, so it’s doubly dear to me! I hope you post a few pics of your new cucina when complete. 😉 sounds amazing! Sounds like you are coping amazingly well despite the cahos all around. And I´m imagining this beautiful dish and it´s making me feel very hungry! Well done you for your approach, and when it´s all over you´ll be so happy! 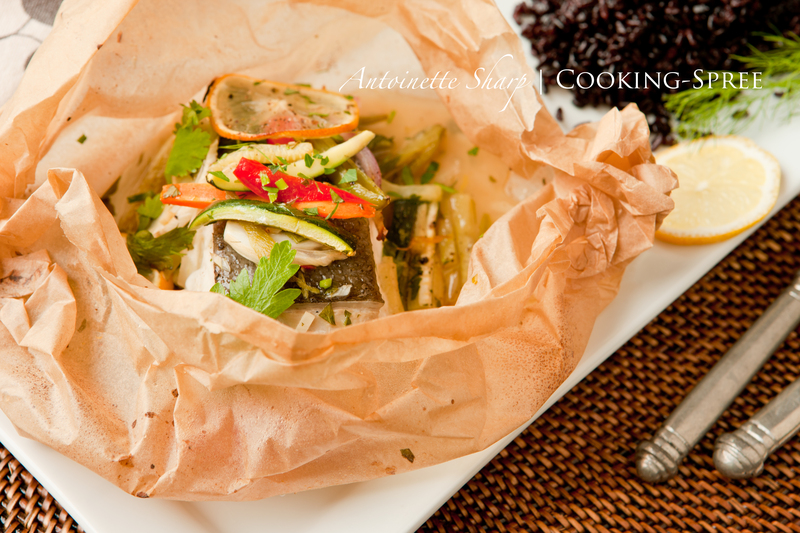 Cooking fish en papillote is a great way to create a flavorful meal. Sounds like you’ll be returning to La Cucina di Spree relatively quickly. YAY! We’ve missed you. I agree! 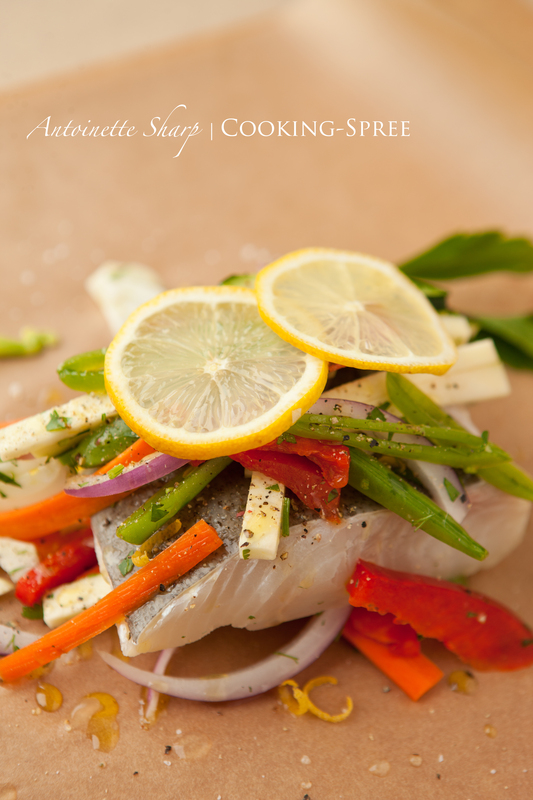 Such an easy way to infuse good flavors into fish in a short time – and the fish always is always left succulent! Thank you for your kind words John. I SURE have missed all of you!! I can imagine it, Spree. As well as being a great photographer, you paint a pretty good picture too! Knowing you Spree, I imagine that some more than just passable treats have come out of your, “make-shift kitchen” and I look forward to more deliciousness from this era- perhaps something to do with a Dutch oven? May you look back upon this time as one of the most special times in your life! Kind of you, Don, thank you!! We actually Haven’t eaten badly, but never did once employ our Dutch oven – it was neatly packed away. The grill came in handy though, and there were lots of good salads – and smoothies – for many a breakfast the blender saved the day! That “very dark moment in life” – you caught me smiling. 🙂 Thanks for that! I can imagine the meal, the bonus is that you get to eat it so soon. Spree, I know what life during renovation works is like, and I think you are doing marvellously, I really do. You sweet Movita you! Merci! Smidge – well, though I’d love to call it a sprint to the finish line, I can’t (if I must be honest and not just sunny-good-natured.) We’re nearly done with our kitchen though – and I do love it! – but two bathrooms are in progress so there’s still quite a bit of foot traffic, lots of dust in the air plastic hanging from ceilings, and brown paper pathways. Another 3 weeks or so and we’ll be there I think! ‘Glad to have you back. I’ve been thinking of you and your wonderful recipes that I have adopted and shared. Your name is probably circling the globe by now! Good luck with the reconstruction. I hope everyone comes when they are supposed to, does good work and leaves your home immaculate. Ronnie – You’re very kind! Thank you SO much for your sweet words and wishes!